Tokyo’s Korakuen Stadium on November 15, 2014. 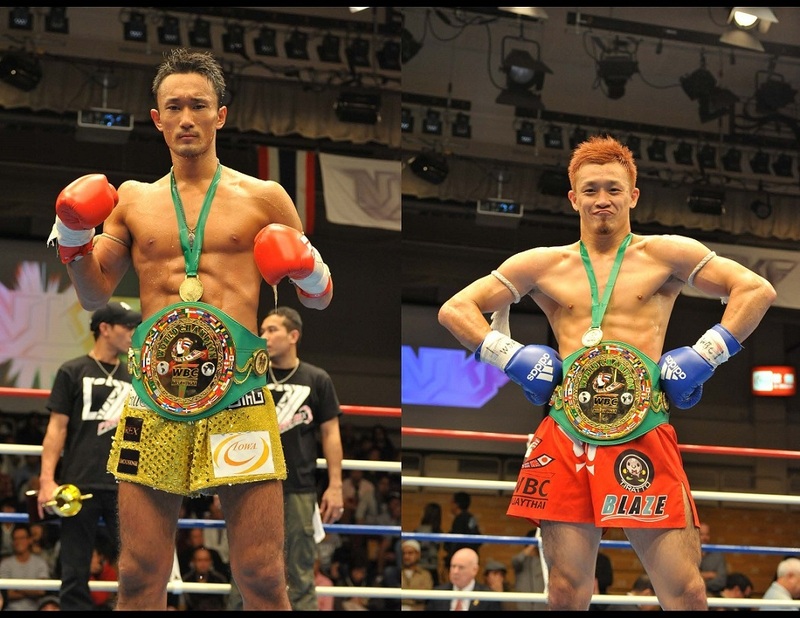 Genji Umeno and Tetsuya Yamato made Muay Thai history, when the two Japanese fighters both won WBC world titles in Tokyo on November the 15th. The twin victories showed that Japan has now taken its participation in full rules Muay Thai to the highest level of professional competition. Report by Miguel Rivera. CLICK HERE to see this story in small screen friendly slider format. Genji Umeno launched out of his corner off first bell and gave Jompitchit Chuwattana the business. He connected stiff jabs at will, along with solid leg and body kicks. Jompichit remained composed and was able to land a few shots of his own. Umeno continued taking it to Chuwattana. He delivered solid punch combinations, transitioned to lightning fast kicks, and punished Jompichit with a wicked elbow in the clinch. In round two, Genji continued his assault on the title, firing boxing combinations and leg kicks. While in the clinch, Umeno used his height advantage to keep Chuwattana at a distance. It nullified Jompichit’s elbow attacks, while still giving Genji enough space to land his knees. Chuwattana came out with a sense of urgency in the middle round and took the fight to Genji. Despite having to fight off the ropes a few times, Umeno continued to outscore Jompichit on both the inside and outside. The 4th and 5th rounds were war in all of its savagery. Sensing he was behind, Chuwattana resolved to leave everything in the ring. Even though Genji had to know that he’d piled up a lead on the score cards, neither was there any coasting for him. He fought like he was behind and went hell bent for the win. It was a memorable exhibition of “Soul in the Savagery” from both title contenders. Because the title had been vacant, Genji Umeno became the new WBC Super Featherweight World Champion. WINNER: Genji Umeno by Unanimous Decision: 50-45, 50-47 49-47. Even Bangkok’s best, like Lumpini champ Saketdao Petchpayatai, seem to start slow. It is thought that they’re schooled to pace the stadium’s gambling action. So it was in Saketdao’s fight against Kevin Ross, where he didn’t get it going until about the middle of round two at the M-1 Grand Show in Los Angeles on October 21, 2011. Off second bell, Saketdao became more active. He blasted kicks and punches. Yamato stayed with his “stick and move” tactics. Saketdao went to his strikes in order to close the distance, where he could work his strength in the clinch. Credit Tetsuya for going Samurai with his elbows in close quarters. Saketdao was undeterred, though, and kept pushing forward. He fired teeps to throw Tetsuya off balance, transitioning relentlessly back to the clinch. Every time Saketdao moved in, though, he was rocked by Yamato’s elbows. At round’s end, the judges had Saketdao ahead on the score cards: 20-19, 19-20 and 20-19. Maybe they were thinking it was the champ’s to lose. While Saketdao went into round three with push kicks and body kicks, Tetsuya rammed the pedal to the metal. He surged forward, no longer “sticking and moving”. Backing Saketdao against the ropes, the Japanese contender exploded a barrage of elbows on the champ’s command and control HQ. The ref called a pause to check on the ensuing blood bath cascading down Saketdao’s face. Summoning a doc to the neutral corner, the medical examination revealed that Saketdao’s nose had been broken. For this reason, the fight was stopped. WINNER: Tetsuya Yamato by TKO (Ref Stoppage for Injury) at 1:53 of Round 3. Tetsuya Yamato vs. Kevin Ross at Lion Fight XI in Las Vegas on September 20, 2013. Photo by Bennie E. Palmore II for Muay Thaimes®. Yamato had to take the measure of Coke Chunhawat. Photo by Josephine Runneboom. Tetsuya Yamato has now earned his badge as “Sheriff of the Comeback Trail”. 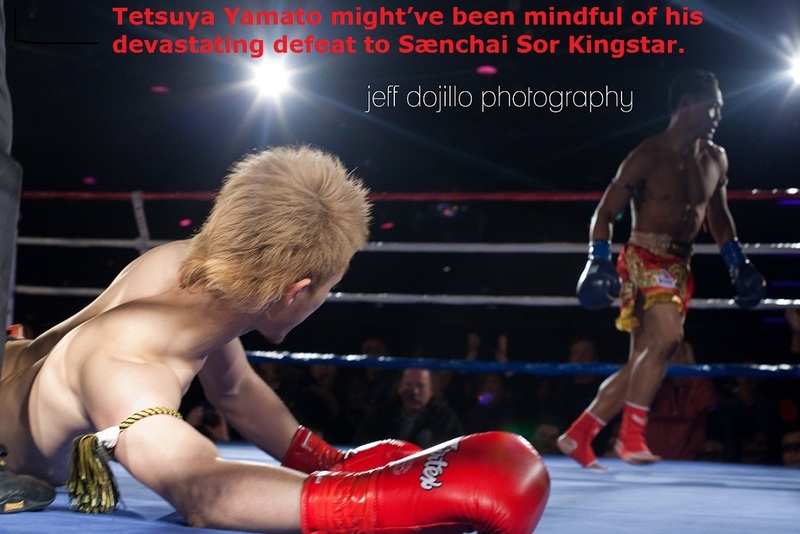 Recovering from a humiliating loss three years ago to Sænchai Sor Kingstar, Japan’s Yamato first had to take the measure of Coke Chunhawat in Los Angeles on August 14, 2011 (See “A Heart Beat away from the Belly of the Beast” in the Spring of 2012 edition of Muay Thaimes®, Vol. VI, No. 1 on pp. 85-86) and Kevin Ross at Lion Fight XI in Las Vegas on September 20, 2013, before ascending to the WBC’s Super Lightweight throne. Tetsuya Yamato (Japan) def. Saketdao Petchpayatai (Kingdom of Thailand) by TKO (Ref Stoppage for Injury) at 1:53 of Round 3 │ 140 lbs. │ 5×3. Genji Umeno (Japan) def. Jompitchit Choowattana (Kingdom of Thailand) by Unanimous Decision: 50-45, 50-47, and 49-47 │ 130 lbs. │ 5×3. Keijiro Miyakoshi (Champion) def. Yukimitsu Takahashi (Challenger) by Unanimous Decision: 48-47, 49-48, and 49-48 │ 135 lbs. │ 5×3. KENTA def. Eiki by Majority Decision: 30-28, 29-29, and 30-28 │ 147 lbs. │ 3×3. TEYON def. Yuya Yamato by KO at 2:26 of Round 2 │ 147 lbs. │ 3×3. Tatsurou YETI def. KEN by Majority Decision: 48-47, 48-48, and 49-47 │ 154 lbs. │ 5×3. MOMOTARO def. DAIKI by Unanimous Decision: All three judges voted 50-47 │ 126 lbs. │ 5×3. Hiroki Maeda def. Kazuji Wakano by KO at 1:16 of Round 2 │ 118 lbs. │ 3×3. Yusuke Shimada def. Jo Utsunomiya by KO at 2:30 of Round 3 │ 140 lbs. │ 3×3. The dual victories in Tokyo were a triumph too for Japanese promoter Kyoji Saito, who seven years ago embarked on a campaign to train and develop Japanese Muay Thai fighters to the elite level so that they’d be able to successfully challenge for world titles. “The sun rises and the sun sets, then it returns to rise again.” [Ecclesiastes 1:5] Photography by Yuichiro Suzuki on the scene and from the archives: Bennie E. Palmore II │ Joséphine Runneboom │ Jeffery Dojillo. This entry was posted in News & Results and tagged Coke Chunhawat, featured, Genji Umeno, Jompitchit Choowattana, Kevin Ross, main featured, Most Featured, Muay Thai, New Japan Kickboxing Federation, Saketdao Petchpayatai, Sænchai Sor Kingstar, Tetsuya Yamato, WBC. Bookmark the permalink.